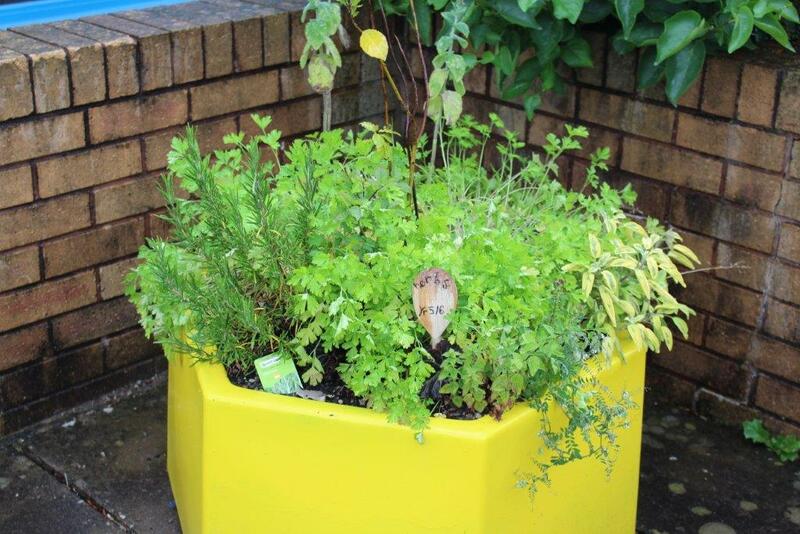 As a volunteer for Butterfly Conservation and the North Wales Wildlife Trust, I have designed and planted many school wildlife gardens in my locality over 10 years or more, with varying degrees of success. But how do you measure ‘success’? Is it about continuity of habitat and species conservation; is it about continuity of the childrens’ experience from year to year, or can it actually be counted a success if on just one day you have woken up one child to the possibilities of nature, gardening and wildlife? Even if your school garden project doesn’t get watered, gets vandalised, gets overgrown with brambles by next year; it can still be worth doing for the children who will become interested in the idea later in life, from the one lesson they had with you about it. 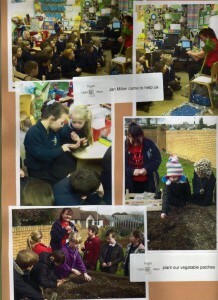 Here are my lesson plans for growing vegetables as well as looking at wildlife in a local school in 2014; I did most of the things described, but not all. You can take however many ideas you like or have time for – but the songs were the most popular! The school I did this project at had had raised beds made by a local company as part of their contribution to the local community. These turned out to be very good as they were just the right height for the smaller children to be able to reach into, but raised enough so that they did not step on the plants they were growing. The Head wanted the entire school involved, so I did one hour with each class over two days in March. I planned to take more full lessons but the school schedule would not allow that (they had an OFSTED inspection that term too – but I think the veggie project helped!) So not all the details in the plan actually happened, often I had to do short things like adding the worms, during a morning break. 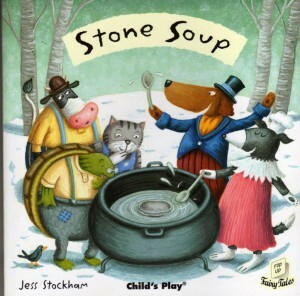 And the Head did not want to do the Stone Soup play or let me make the vegetable soup at the end of term. Some of the children told me they had not tasted any of the vegetables because they had been sold for school funds. This was a shame, I felt; one of the main aims should have been to get kids trying new vegetables – I know growing their own got my kids to try new tastes they would never do otherwise. But the talk at the beginning with the basket full of vegetables, and the songs while planting out the seeds were the most successful parts for me and the children. 3.Link to biodiversity and the natural world; minibeasts found in the soil, life cycle of earthworm, what soil is made of, food chains, disease, contamination; Pollination – life cycle of the butterfly and how different bees live. How is it I can buy lots of fruit and veg in the shop that it is too cold to be growing here now? 4. 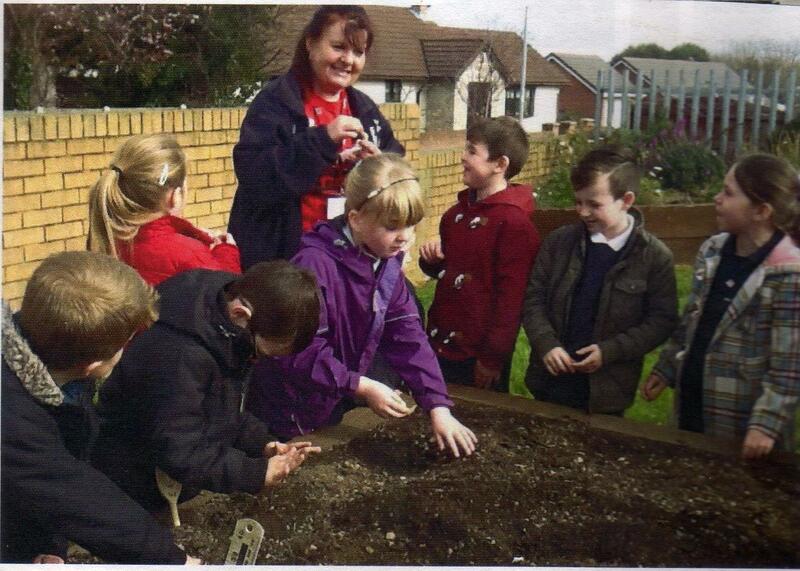 Practical task; different groups of children take a different vegetable and its seeds. (You can collect packets of old seed from your own store or friends – it does not matter if they are all viable, but that each child has seeds to handle and to plant. With a class of over 30 pupils it will be unlikely that you will have enough space if all the seeds grow!) They can sow seeds direct outside in March, in most parts of the UK; or use plastic plug trays of compost to germinate on the windowsill, or with eg. Broad Beans, put kitchen towel/blotting paper into a glass jar, wet it and slide 4 beans down the side between the paper and glass to watch how it grows. Remind them to check for water every day. 5. Go to the allocated outside seed bed, take our class’s seeds and dig in compost and chicken manure pellets. Put measuring cane across the end of the bed and take turns to put in your seed(s) while singing the song. They just loved digging a hole and throwing a seed-potato in; after covering the seeds up I asked ‘And what is the last thing we have to do now?’ (meaning watering) – and a five-year old boy solemnly intoned ‘Now we must wait’ – pretty good for one so young! But delayed gratification is one of the things young children can also learn from this project. And a pointy little hat. The roots grow into carrots that have vitamin A. Large format, few words per page, nice step by step pictures of how plants grow. A really inspiring large format book about how older children (6 to 10) grew vegetables and fruit with their grandfather throughout the year and made a picnic at the end of summer for their mum and new baby sister. 1. Look at how our seeds have grown; (we can dig up one to see how much root there is) – the children could keep a weekly record of how tall their seedlings have grown (measure against a ruler) . Classes with Broad beans in jars could draw the root and shoot coming out in their books. 4. 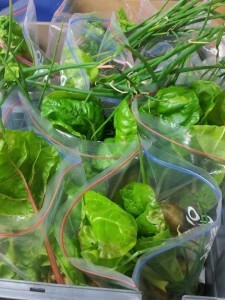 Plant out those seedlings that are big enough to go outside now and put our labels in. 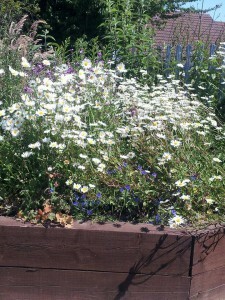 (might need to be nailed to the side of the deep bed if they might attract other children to pull them out?) give responsibility to a rota of children to water them if dry weather. 5. Start a class big book about how our vegetables grow – including the children’s drawings, graphs, observations and photos (Take photos in lesson 1 of seed-sowing. etc.). If you scan the record in they could each have a copy at the end of the year on a CD? Or they could each have their own exercise book (including plain pages) so they can have individual records, including their own drawings and photos printed off the computer, to show to parents and to keep themselves. Or it could be all done on their own laptops, tablets if they have them. 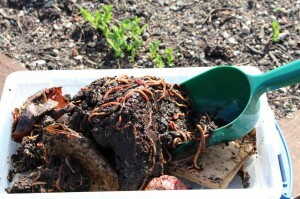 Adding worms brought in from wormery compost bin. 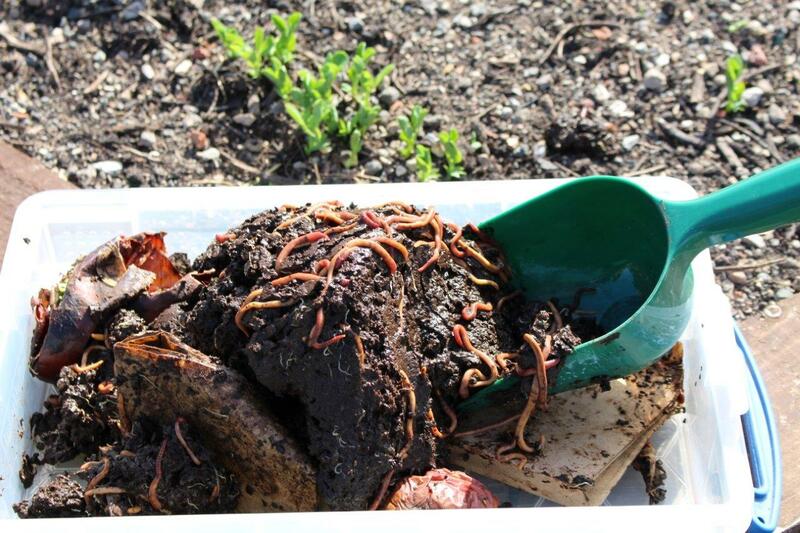 (You can get these bins, or just buy the worms, from www.wigglywigglers.co.uk ) Talk to the children about why we need animals and fungi in the soil to release nutrients from the organic matter. 1. Look at how our plants have grown – measure the difference in height since we started. (If some seeds have failed entirely I can bring in seedling plants from B&Q. or my own garden) We can pull one or two of them up to see how the roots have grown – talk about nitrogen-fixing nodules on the peas and beans. 2. Pull out weeds – what are weeds? Why don’t we want them here? 4. Write some more entries for our big class book about the project. 1.Look at how much our plants have grown; add data to the graph. 2. If the plants are in flower, look at which insects are attracted to them and talk about pollination. we may even be able to harvest some things already and try eating them. 3. Look at the life cycle of the cabbage white butterfly; make a dial of the cycle (see templates and activity sheets on www.7wells.co.uk ) and learn the song about it. 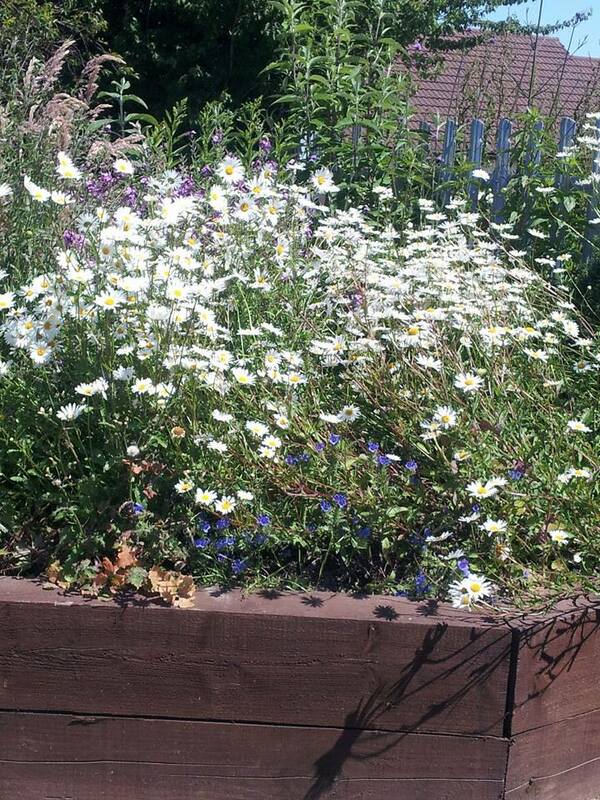 We also made a Butterfly and other Pollinators bed. 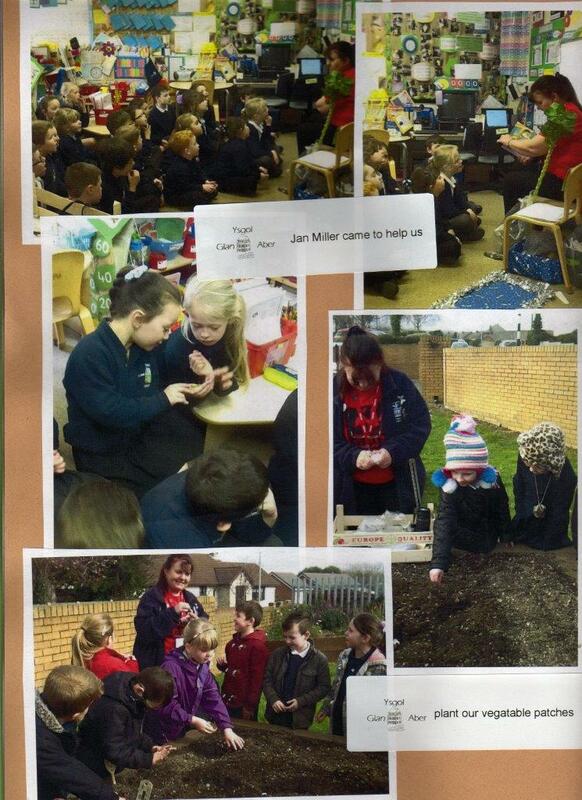 First crops were shown on school website. Densely planted peas meant no staking really needed and no weeds. Broad Beans, onions and peas easy to pick. 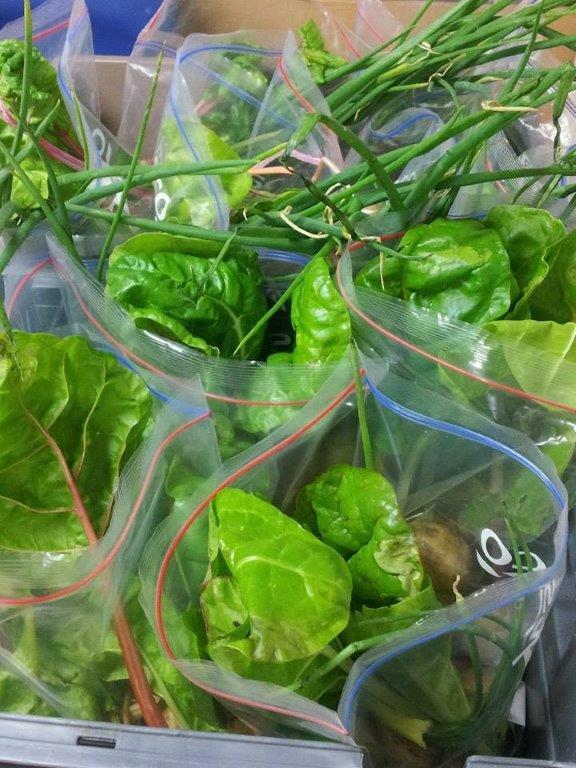 The children from each class in the school ‘Eco-council’ picked and bagged the veg as they were ready and sold them at home time to parents at 50p per bag. 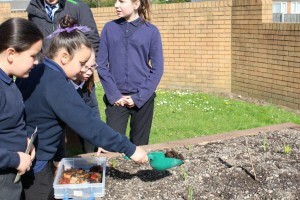 Very often the main problem with a school garden is not the funding, preparation work or the planting that is difficult, but the maintenance afterwards. Bear in mind that there will often be no-one there to water, harvest or see the plants from the end of July until the beginning of September (in the UK). This should dictate which plants you choose as there is no point growing vegetables and flowers that the children are not going to see, also there are not many plants you would wish to grow that can cope with long periods of drought. And the gardens can get badly overgrown in one season if no-one looks after it; often the contractors employed to make the garden had just strimmed back brambles at the edge of a playing field – I could see new bramble and nettle shoots sprouting up as we planted our new garden. Of course they easily took over again by the end of the year if no teacher or parent was vigilant. Laying down a water-permeable membrane can help to control this. Another problem is ponds – most people who want to encourage wildlife want a pond; but in school grounds this makes staff and parents very nervous about young children accidentally drowning, with good reason. So what tends to happen, if you insist on a pond, is that the school insists the whole wildlife garden be fenced off with a locked gate. And no children are allowed in it without supervision. Many of the ponds that contractors had been paid to make with butyl liners had been deliberately punctured later. One school I went back to after a couple of years had even lost the key to the gate padlock – so you can guess how much use they had made of the garden – but then maybe the wildlife had been left in peace to use that habitat for a while? I think it would be far more useful from an educational point of view to have an unfenced wildlife garden that children can wander round, play in and observe and even record creatures and plants in their lunchbreak (using laminated charts that can be kept in the foyer). It doesn’t matter if they break a new pathway through the plants, as one teacher complained to me – at least the kids have been using it! And having just a boggy area (also with a butyl liner) or a small raised pond in a container, perhaps with a plastic or metal grid over the top, would make it safer. of how to be growing. That makes a garden grow, grow, grow. What brings the seedlings up from the ground? Bright yellow sunbeams shining round. Help bring the seedlings up from the ground. 2nd verse: The rain falls on the ground. 3rd verse: The sun shines bright and warm. 4th verse: The seeds begin to grow. 5th verse: Flowers grow everywhere. 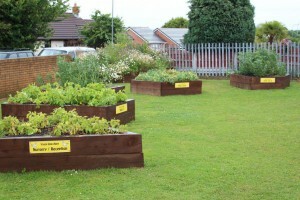 A wonderful scheme to get children involved in growing vegetables. A whole generation has missed out on learning these skills so these youngsters have not had this knowledge passed down from their parents, as my generation did. Growing is a wondrous experience for children and the skills are best learned young. Whatever route these children take in life they will always have this remembrance and many of them will continue to use it. Great stuff, Jan, keep going and keep us informed! Interesting what you say – some of the kids had never seen a raw potato before and did not know that’s where chips come from! Fabulous lesson plans Jan. I will definitely draw upon these for our Eco-Club at school next term. Especially the songs! Just what I needed – thank you for sharing.